Envision was used daily, across the majority of the Queensland Curtis LNG (QCLNG) project, as the single source of truth for making key decisions that affected project delivery, including schedule and cost. QCLNG is the world’s first project to turn gas from coal seams into liquefied natural gas (LNG) and is one of Australia’s largest capital infrastructure projects. A significant volume of construction works have been delivered by Thiess, including all 17 field compression stations (FCSs) and four central processing plants (CPPs). Envision was deployed by the Thiess team as the primary construction management platform supporting 11 central and northern FCSs and three CPPs. It helped the team tackle an ambitious delivery schedule, large geographic separation across a field the size of the United Kingdom (UK) and complex logistics. Top-down/bottom-up team engagement – Envision was actively driven by the senior management team, supported by the willingness for the team in the field to make it part of their every day practice. Live, anywhere, anytime oversight – Envision’s web-based, mobile interface meant that people could access data and reports from anywhere and the client could monitor the project from around the world. Envision was implemented by a joint team of engineers from Thiess and Ennova, following a detailed implementation plan. To best address the sizeable project field and regions, a multi-pronged approach was used involving: – Two dedicated team members on-site in each of three regions to support the project controls team for the life of the project – In-house and remote strategic support to the central project controls team in the Brisbane project office – On-site, ‘live’ coaching via site walk-throughs with supervisors – Web-based support materials, ‘cheat sheets’ and other immediately-available resources. Once deployed, the Thiess team played an active role in enhancing Envision to better address the needs of the project. Late last year, in collaboration with Thiess and QGC, Ennova implemented Envision across 14 upstream compression facilities in Queensland – projects valued at around $2 billion. They all faced an ambitious delivery schedule, large geographic separation and complex logistics. 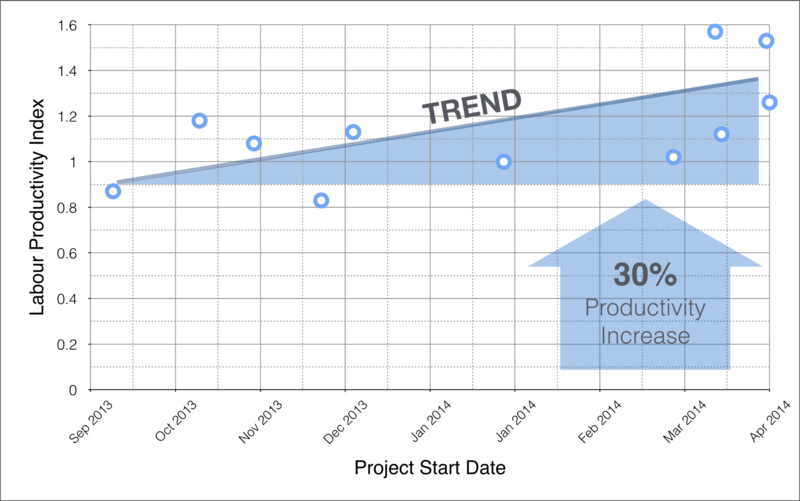 As the projects progressed, Envision focused the project team’s ability to measure and drive execution. Envision was used daily as the single-source-of-truth for making key decisions that affected project delivery, schedule and cost. The team collected more than 7,000 photographs linked to either Activities or Events, encouraging conversations including attracting more than 10,000 individual comments. Envision helped the team collaborate and share project information, building a collective brains trust that helped improve productivity. With a large majority of labour time being captured within Envision, labour productivity could be calculated for each facility and plotted against time using the effective project start date. With greater visibility around progress and real-time input directly from the field, the team was able to demonstrate an improvement in labour productivity of around 30% between the first and last facility. Detailed progress information collected from Activity and tagged item progress provided insight into the relative schedule performance of the 14 different construction projects. 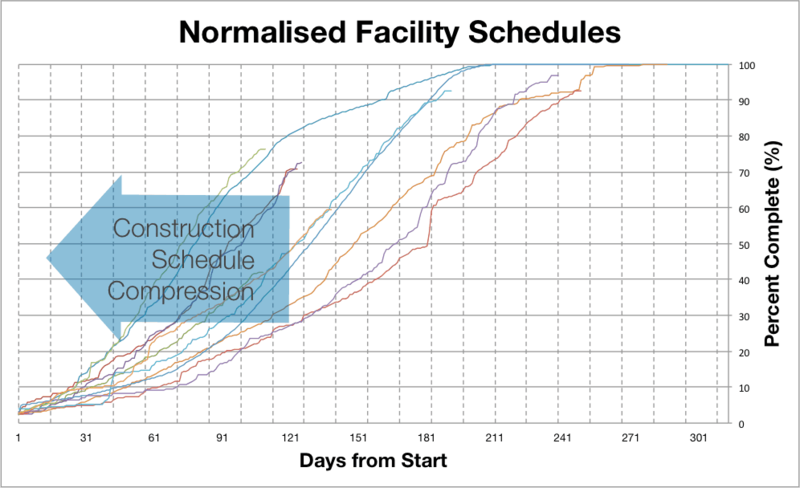 Referred to as ‘racing curves’, the normalised schedules highlight the relative improvement in construction time with the more recent projects being completed in significantly shorter periods. In the coming months, we will develop a detailed QCLNG case study and publish that on our website.